Heat the oil in a skillet over medium-high heat. Add the onions. Season with salt and cayenne. Saute for about 2 minutes, or until slightly wilted. Add the peppers and 1 tablespoon garlic and continue to saute for 1 minute. Season the shrimp with Creole Seasoning. Add the shrimp to the pan and saute for 2 minutes. Stir in 1/4 cup of the green onions. Remove and set aside to cool. Make a batter by combining the beaten eggs, milk and baking powder(substitute this step with French Market Beignet Mix and just add water). Season with salt and pepper. Add the flour, 1/4 cup at a time, beating and incorporating until all is used and the batter is smooth. Add the seafood mixture to the batter and fold to mix. Season with salt and cayenne. Heat the shortening to 360 degrees F. Season with a dash of Worcestershire Sauce and hot sauce. Drop the batter, a heaping tablespoon at a time, into the hot oil. When the beignets pop to the surface, roll them around with a slotted spoon in the oil to brown them evenly. Remove and drain on paper towels. 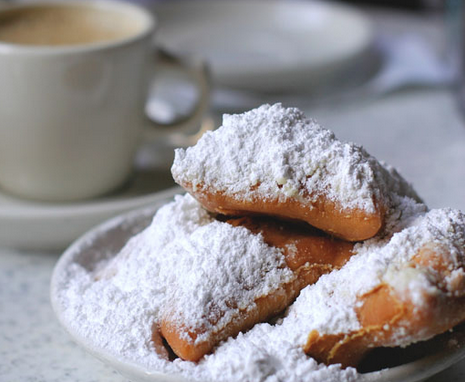 Season the beignets with Essence. Serve the beignets with Remoulade Sauce. Yields: 2 dozen.